Merton Abbey Mills is a bustling weekend market, located on the cusp of Wimbledon and Colliers Wood. It is known as London's alternative market and prides itself on all the lovely arts and crafts it sells. In a leafy, peaceful setting with the River Wandle meandering through the middle of it, Merton Abbey Mills is steeped in history and in the middle ages, a monastery called Merton Priory stood on the site. William Morris (the famous English textile designer) acquired the seven acre site back in 1881 because of the quality of the water in the River Wandle. The site included dye-works, carpet and tapestry weaving, stained-glass window making and textile printing. In fact, all the Liberty silk prints were manufactured at this site from 1940-1972. Apparently 200 years ago, there were around 100 watermills on the River Wandle. The historic old wheelhouse at Merton Abbey is the only one remaining and has been restored so it is still in full working order. Liberty used it to rinse the gum off the printed silk for its fabric designs. 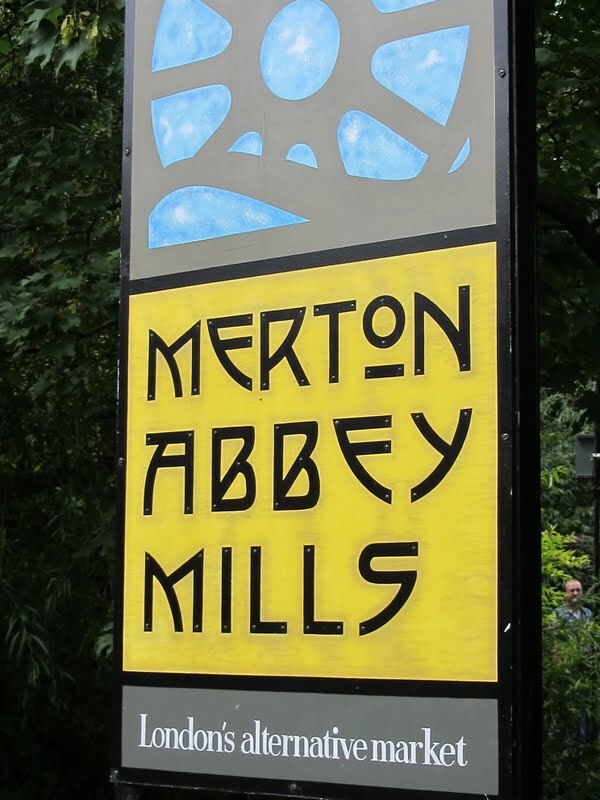 I first visited Merton Abbey Mills back in the early 1990's. It was the day of the Wimbledon tennis men's final, and a scorching one at that. I'd heard there was an arts and crafts market in Wimbledon, so I went to check it out. I got there to find a colourful oasis of stalls selling papier mache gifts, homemade jams, handmade jewellery and ceramics, fresh flowers, herbs and all sorts of other delights. It was a wonderful discovery, so I whiled away a couple of hours, bought myself a bright pink papier mache mirror, and went on my merry way to the tennis, when it used to be free just to walk in (before the days of Henman Hill, endless queuing and tent-pitching). Armed with a picnic, I joined the masses on the grass and watched Pete Sampras beat Jim Courier on the big screen. It was a perfect afternoon. Last month, I returned to Merton Abbey Mills to meet a friend for lunch. It was just as I remembered all those years ago, although my penchant for papier mache bowls and incense sticks has thankfully diminished drastically. It was good to have a wander around and see various farmers market stalls selling fresh breads, chutneys, cheeses and cider. The jewellery shop which specialises in crystals and semi-precious stones was still there (I do love a lump of rose quartz or amythest). But my favourite place is without a doubt, The Wheelhouse with the wonderful restored waterwheel still turning after all these years. There is such a vibrant and buzzing community spirit at Merton Abbey Mills, and apart from the market stalls, there are some great restaurants (we had a good lunch at Ban Yai Thai) and cafes, theatre and music events and a pottery workshop. It's a good place to take kids as there are various activities including a children's theatre. And if you enjoy live music, there's a live Blues Club every Sunday evening!